Twenty years ago today, massive demonstrations in East Germany finally bore fruit when Erich Honecker was forced to step down as party leader. Tension had been building in East Germany for weeks. In August Hungary had removed its physical border defences with Austria, and in September more than 13,000 East German tourists in Hungary escaped to Austria. This set began chain of events. East Germans flooded the West German embassy in Budapest and refused to leave. This triggered similar events in Czechoslovakia. The East German authorities allowed the East Germans in the Prague embassy to leave for West Germany, providing that they used a train which crossed East Germany on the way. Meanwhile, a series of peaceful political protests in East Germany, which came to be called the Monday demonstrations began in Leipzig on September 4, 1989. This soon became a routine event across the country every Monday evening. The right to travel to the West was one of the key issues. At this demonstration (below) on September 4, 1989 protesters carry a banner calling for ‘freedom to travel instead of mass exodus’. On October 7, 1989 the East German government had prepared huge celebrations to mark the 40th anniversary of the communist regime. The Soviet leader, Mikhail Gorbachev, arrived in Berlin as a guest of honour at the anniversary celebrations; he warned that ‘life punishes those who come too late’. As Gorbachev made his way down Berlin’s Unter den Linden towards the Palace of the Republic, the seat of the East German government, crowds lined the street shouting ‘Gorbi, Gorbi’ and ‘Gorbi, help us’. The tension between the two leaders was palpable. 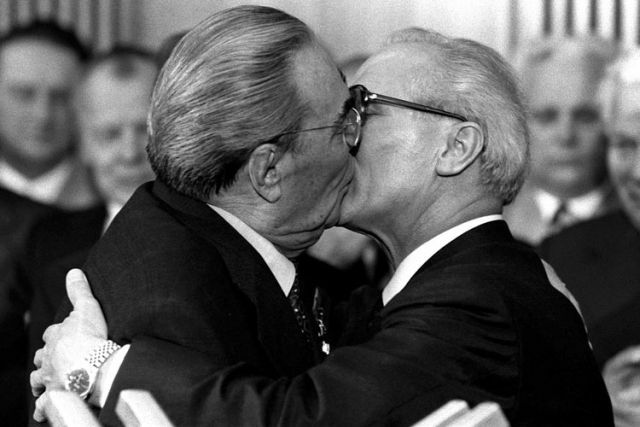 Gorbachev urged that the GDR must be ‘willing to cooperate with all the powers of society’, but Honecker said, ‘We will solve our problems ourselves with socialist means’. Protests outside the Palace of the Republic on the night of the anniversary were crushed, while army units and plainclothes secret police operatives also attacked demonstrators in Berlin’s Prenzlauer Berg district. Many protestors were beaten up and there were 500 arrests. In the Nicolaikirche, the 800-year-old church in Leipzig that had become the focus of the protests, 8,000 people had assembled, with many thousands more outside demanding their freedom. Between 70,000 and 100,000 peaceful demonstrators braved warnings from the Stasi and the presence of thousands of armed riot police to march to the city centre. In the end, the police did nothing, setting the stage for the peaceful revolution that swept across East Germany. Although armed police and soldiers were present, there was no violence. In the power struggle within the communist leadership, those with no stomach for a ‘Chinese solution’ appeared to have gained the upper hand. Crucially, Honecker was not going to be able to rely on the almost half a million Soviet troops stationed in the country to deal with the unrest. It later emerged that Gorbachev had expressly given orders for the Soviet troops to stay in their barracks. On the anniversary of the October 9 protests last week, German Chancellor Angela Merkel and President Horst Koehler were present at a ceremony in Leipzig to mark the demonstrations that took place there 20 years ago. ‘On October 9, 1989, 20 years ago, the people of Leipzig showed us what citizens can achieve when they believe in their own strength and take their destiny into their own hands’, Koehler said. 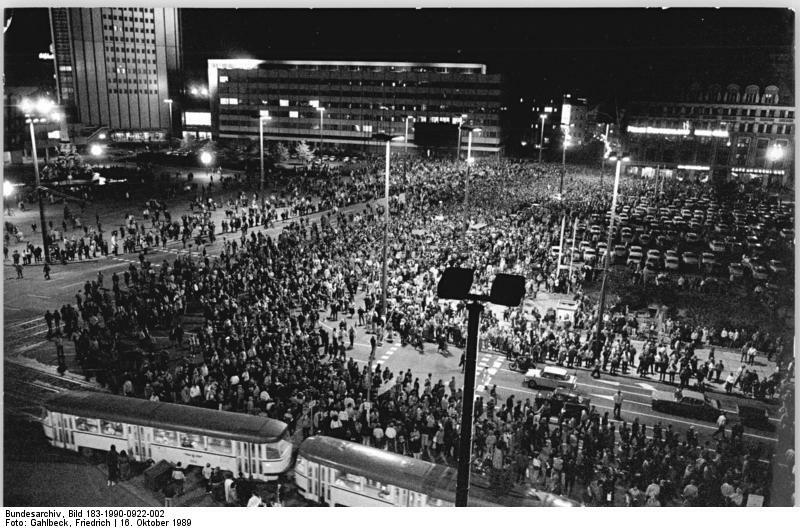 The protest continued: a tram is blocked by East German demonstrators in the centre of Leipzig (above) on October 17, 1989. Their banner reads: ‘Legalization of opposition parties, free democratic elections, free press and independent unions’. A day later, just 11 days after celebrating 40 years of the GDR, Honecker was forced to step down as Communist party leader and head of state, to be replaced by Egon Krenz. The East German state was living on borrowed time. Honecker had predicted in January 1989 that the wall would stand for a “hundred more years”, but the demonstrations continued – until the night of November 9, when the Wall was finally opened. 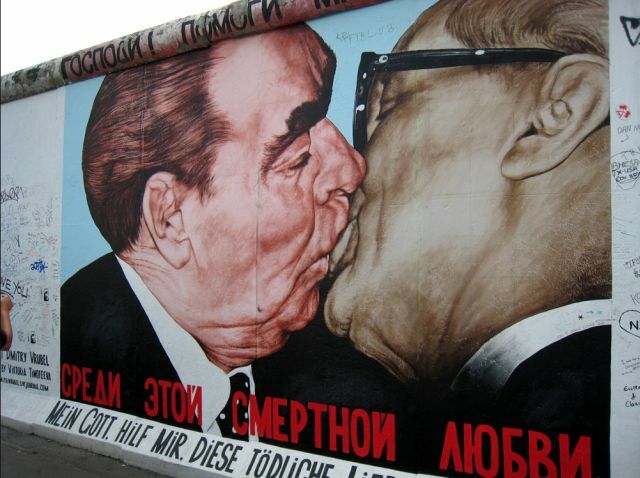 It became one of the most famous images on longest remaining stretch of the Berlin Wall, preserved as part of Berlin’s East Side Gallery. The Russian artist Dmitri Vrubel painted the mural in 1990, just months after the Wall was officially declared open. Alongside Vrubel, 117 artists from 21 countries painted the 1316-meter-long section which runs parallel to the Spree River. But in March 2009 the image was removed, leaving an old slab of grey concrete – and an irate artist. Pingback: Radarboy » Blog Archive » Happy 9-11 Berlin – Wir sind das Volk!